Looking for an AWESOME appy to make next time you have company over? Heck, I’d even make this just for me and my husband. Every time I’ve made this it’s gotten rave reviews, I usually make it around the holidays so I thought it needed to be shared. There’s a printable recipe below. I really like to do the bulk of the work for this recipe the day before and stick the tomato mixture in the fridge. I find when it’s cooled down it’s easier to scoop onto the baguettes too. Be sure to eat these fresh out of the oven once they’ve cooled off a bit, that’s when they’re the tastiest! 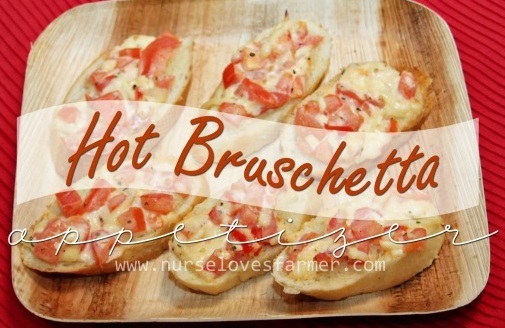 Mix up tomatoes, mayo, cheese & spices, spoon onto butter baguette slices and bake in the oven to serve hot! Absolutely delicious! - Use roma tomatoes as they don't have as much "tomato guts"
- Can substitute mozza cheese for any cheese micture,I had to use a bag of shredded white/orange cheddar at Christmas this year and it was still delicious! - Eat them fresh out of the oven for optimum deliciousness! I hope you enjoy, let me know if you do! « Can You “Train” Your Children? Yum! Thank you for the easy app recipe. My recent post Frozen food – is it good? 'they are' not 'it is'. Thankyou for sharing! I've had these twice and it is so freaking good!! !